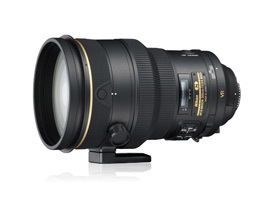 With a full-aperture of f/2.0 this lens is the fastest telephoto in Nikon’s current line up. As the latest in a long line of 200mm f/2.0 models that date back to the 70’s this lens is rarely publicized, and even today, the autofocus 200mm f/2.0 is made in relatively small numbers. It’s perhaps this rarity coupled with the lens’ reputation for stellar image quality that makes this one of the most intriguing lenses in the firm’s range.This version was updated in September 2010 with the new 4-stop VR II specification, and Nano Crystal Coat. In addition to the usual three ED glass-elements of Nikon’s super-telephoto lenses, before the up-dated 80-400mm was introduced, this model was the only lens in the range to feature an additional Super ED glass element to reduce chromatic aberration. Weighing in at 2,930g, the lens adopts an ultrasonic type AF motor, focuses to just 1.9m (6.2 ft.) and costs a not insignificant $5,820. Mounted on a 36Mpix D800 the lens achieves a DxOMark Lens Score of 39, making it one the best performing lenses ever measured in our labs. 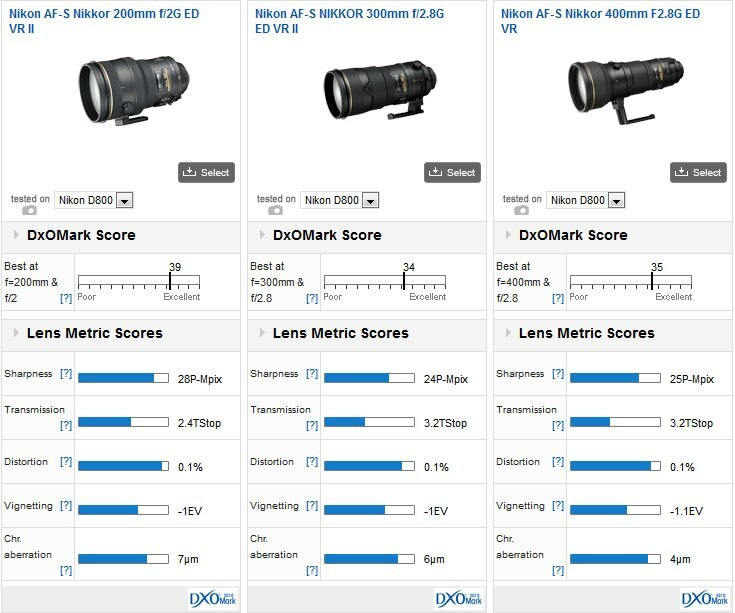 What’s more with a Sharpness score of 28P-Mpix this lens is the sharpest Nikon mount lens we’ve tested, putting ahead of lenses like the Nikon 85mm f/1.4 and f/1.8 models but also the Sigma 35mm/1.4 and the recently tested 300mm and 400mm f/2.8 telephotos. 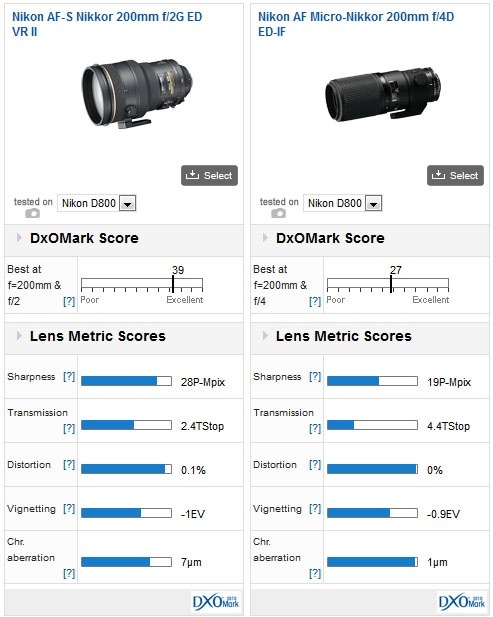 Additional individual lens metrics scores reveal the lens to have negligible distortion, mild vignetting and reasonably low levels of chromatic aberration. Transmission is very good, though not quite matching the theoretical f/2.0 maximum. If we compare the ultra-high speed 200mm f/2.0 model against the firm’s f/2.8 telephotos the lens is the best performer of the three. That said, all three are outstanding performers. Regardless of focal length, there will be no disappointments. We’ve not yet measured the equivalent Canon EF 200mm f/2.0L IS USM model but comparing the lens with the Nikon AF Micro-Nikkor 200mm f/4D ED-IF reveals some interesting facts, even if the two lenses are designed for different roles. First, the 200mm f/2.0 is much sharper. 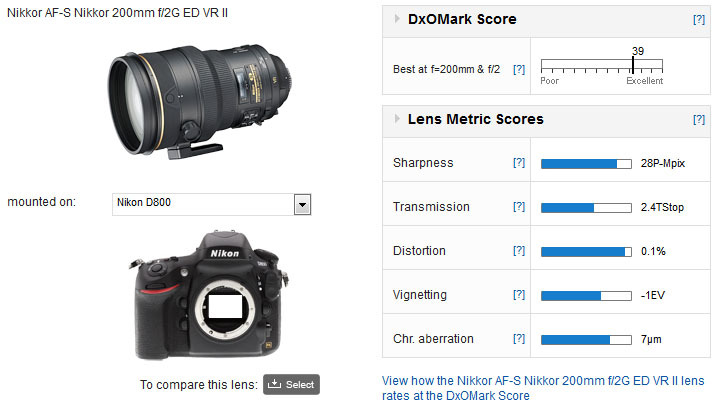 In fact the 19P-Mpix Sharpness score of the Micro-Nikkor on the D800 is a little disappointing. Second, the Micro-Nikkor has extremely low Chromatic Aberration. While it’s a pity we’re unable to compare the Nikon 200mm f/2.0 against its rival Canon offering, the Nikkor lens is optically outstanding – there isn’t much more you could ask of it. It is, however, less versatile than you might expect and if it’s affordable, it won’t be a disappointment.